Flagler County has furnished the state of Florida with its initial “individual” damage assessment reports from Hurricane Matthew in the amount $72,820,117. State of Florida Department of Emergency Management will travel to Flagler County to perform its own assessment to ensure they are in agreement with our initial individual numbers. Estimated residential damage totaled $66,124,679. So far, 11 homes in Flagler County were destroyed. Another 164 received major damage, which – by FEMA definition – means that repairs are possible, but not within 30 days. These numbers will likely change. Homes that received minor damage – that which can be repaired in fewer than 30 days number 294. In total there were 1,276 with properties that were “affected,” which can include things like a fallen tree leaning on a house that has not penetrated it. Unincorporated Flagler County suffered $49,659,830 in estimated total damages – and $48,033,938 in residential damages. That includes 462 affected single-family homes, 242 with minor damage, 159 with major damage, and six that were destroyed. Flagler Beach had total estimated total damages of $15,178,829 – and $13,166,109 residential. Five homes were destroyed, another five suffered major damage, 27 minor damage and 558 affected residential homes were affected. One restaurant suffered major damage, one with minor damage and another five were affected. Damage to restaurants is estimated to be $426,402 and hotels suffered another $414,302 in damages. Total estimated damages in Beverly Beach are estimated to be $4,001,517. Marineland suffered an estimated $135,515 in damages. Palm Coast total damages are estimated to be $3,585,412. Total damages in Bunnell are estimated at $259,014. Flagler County Continues to operate a call center from 6 a.m. to 8 p.m. at 386-586-5111. The Red Cross has established a Hurricane Matthew hotline at 800-768-8048 to provide information about the resources available in every county. The Flagler County Sheriff’s office is investigating at least 14 residential and three commercial burglaries that occurred as Hurricane Matthew came through and the two days that followed. In most cases, the burglars targeted homes or businesses where the owners had evacuated. Guns, jewelry, electronics, cash and even a vehicle were stolen. In two cases, residents lost their unsecured generators when someone stole them from their property – one, valued at $1,200, had just been turned off for the night. The main point of entry in the home burglaries was kicking in or damaging front doors or shattering back sliding-glass doors. The residential burglaries occurred in Palm Coast and Bunnell. Robert Weidig Gunsmith, 15 Utility Drive, Palm Coast. 41 firearms stolen. Cricket Wireless, 1499 Palm Coast Parkway N.W., Palm Coast. Two deposit bags and petty cash were stolen. 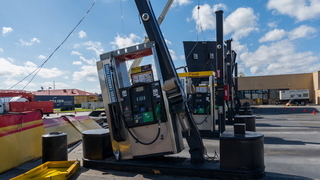 Mobil gas station, 5935 E. S.R. 100, Palm Coast. Still under investigation. The Sheriff’s Office is asking for the public’s help solving the burglaries. Observant and vigilant neighbors can provide a good description of a suspect or suspects or vehicles involved can be a great help. Detectives said if you see something suspicious, it’s important to say something. Anyone with information that can help the Sheriff’s Office is asked to call 386-313-4911. If you prefer to remain anonymous, you can call Crime Stoppers of Northeast Florida at 888-277-8477. Tipsters may be eligible for a reward of up to $1,000. Gov. Rick Scott and Rep. John Mica toured the damage of a one-mile stretch of State Road A1A in Flagler Beach where a large portion of the road was washed away when Hurricane Matthew lashed the area. They said the next step is starting a restoration project. Scott and Mica said they can't say for sure when the project will start. They did say it’ll be a project that will take several months. Mica said the damage to A1A caused by Hurricane Matthew is the worst to the state's transportation system. Looking at the damage, Scott and Mica determined that the cost to fix the road will be very high. Scott said the state will be working with the federal government for funds, as well as the Army Corp of Engineers. Both men said they will work on preparing contracts to begin the work, then work on a preliminary design. "We're going to work with the governor and the mayor and others and the county,” Mica said. “This would bankrupt Flagler Beach and the county to restore this." Another topic that came up at the news conference was the safety of the beaches. Flagler County's beaches will be closed until further notice because of safety issues. That debris includes wood from the pier that was partially destroyed, roofing nails, and both metal and wood from the dune walkovers, which have also been left unsafe for use. The Flagler County Supervisor of Elections offices reopened Monday. The Palm Coast Branch of the Flagler County Public Library will be open from noon until 5 p.m., with limited services available. There will be a limited supply of water and ready-to-eat meals distributed from this location. For general questions, use the citizen information call-in line at 386-586-5111 or www.flagleremegency.com. Hours of operation are changing to 6 a.m. to 8 p.m.
Flagler County will open an assistance center on Wednesday to help residents get information and some resources for their needs in the wake of Hurricane Matthew. The center is ahead of a potential FEMA Disaster Center. The center will be housed at the Palm Coast Branch Library at 2500 Palm Coast Parkway N.W., and it will be open from 9 a.m. to 6 p.m. beginning Wednesday. Multiple agencies will be located at the Assistance Center, including United Way, Stewart-Marchman-Act Behavioral Healthcare, American Red Cross, Salvation Army, Flagler County Health Department, Flagler County Human Services, Flagler County Homebuilder’s Association, Department of Children and Families, FEMA (once they arrive) and Verizon with two charging stations. “There are already people at the library charging their phones,” said Flagler County IT Director Jarrod Shupe. “It is really great that they provided us with these charging stations. Small satellite facilities will be set up at the Adult Education Center at 5633 N. State Road A1A in Hammock, and at the Hidden Trails Community Center at 6108 Mahogany Blvd. in Daytona North. Residents will be pre-screened for necessary services and provide counseling. Flagler County will be waiving some building permit fees to fast-track the permitting process for those whose properties were damaged by Hurricane Matthew. The county will waive fees for permits that are related to hurricane damage until December 5. Contractors must be registered with Contractor Licensing to work in Flagler County. Proof of License and Liability Insurance is required. Residents and business owners who have questions about either permits or inspections should call the Flagler County Building Department at 386-313-4002. Flagler County Continues to operate a call center from 6 a.m. to 8 p.m. at 386-586-5111. The Red Cross has established a Hurricane Matthew hotline at 800-768-8048 to provide information about the resources available in every county. There are several spots throughout Flagler County where residents can get a meal on Tuesday, and the American Red Cross has four roving vehicles distributing meals. The Salvation Army is near the Bunnell Housing Authority, 414 Bacher Street, Bunnell, noon until 6 p.m. The Salvation Army is in Beverly Beach providing meals at 2814 N. Oceanshore Blvd., near Surfside Estates at noon to 6 p.m.
Red Cross is providing meals at the Adult Education Center parking lot, 5633 N. Highway A1A, Hammock, at noon and 5 p.m.
Red Cross is at Flagler County Main Branch Library parking lot, 2500 Palm Coast Pkwy NW, Palm Coast, providing meals at noon and 5 p.m.
Red Cross is at Town Center in Palm Coast (where the food trucks stage), 975 Central Avenue, at noon and 5 p.m.
Red Cross is providing meals at Hidden Trails Community Center parking lot, 6108 Mahogany Blvd., at noon and 5 p.m.
Four roving vehicles are circulating throughout Flagler County. The “Point of Distribution” for food and water at the Flagler County Executive Airport will close at 4 p.m. Tuesday. Supervisor Jacob Oliva reported that school staff is working hard to clean all of its facilities so classes for students can be resumed. Church on the Rock is at 2200 N. State Street, Bunnell. The phone number is 386-437-9915. Most of State Road A1A in Flagler County is undrivable, with long sections of the highway washed out by the storm surge. "It's unbelievable what nature can do," storm survivor Cheryl Combee said. "We're blessed. I feel very blessed by God." Combee said she realized she was lucky after choosing not to evacuate from Beachside because of her cats. She said she wouldn't stay behind again. "It was very scary," she said. "You don't know what's going to happen. You're risking your life." The damage was heaviest in the northern section, in Marineland Acres. There was damage to the Flagler Beach Pier, but there's no specific assessment yet. A husband and wife had to be rescued from their home, but no deaths or injuries were reported. Inoperable stop lights must be treated as four-way stop signs. “We cannot have people going through intersections without checking for traffic coming from the opposite directions,” said Flagler Beach Police Chief Matt Doughney. For general questions, please use the citizen information call-in line at 386-586-5111. People are answering calls 24 hours a day to help keep the 911 lines free for emergencies. The damage in Surfside Estates was overwhelming. There are a few hundred homes in the neighborhood and large parts of roofs were torn off; the side paneling to homes was found down the street. About every other home has some sort of damage to it, most of it pretty significant, such as screen porches blown away and awnings ripped off. Many people said it looked like a tornado touched down. “It was heartbreaking coming through here and seeing some of our neighbors’ homes are gone," Therese Morgan said. Morgan evacuated to Tampa for the last three days with her family, unsure what she was going to come back to. Dozens of neighbors returned to find only half of their homes intact. Morgan said it looked as if the winds played hopscotch with the hundreds of houses throughout the neighborhood. "Driving around today, it would skip a couple of homes and then the next home, the fronts are demolished, the roofs are gone, you can see through the homes," Morgan said. Robert Hudson's home was left untouched. His next door neighbor's carport was ripped off. "It could have been a lot worse if that hurricane would have been inland a little more," Hudson said. "If it had been 150 miles an hour, I don't think we would even be here right now." Street after street, it was the same scenario. Panels and awnings torn off, pieces of glass and metal scattered through yards, the sides of some houses leveled. Ed Noack said he imagined the hurricane was going to be bad, but seeing the reality of the force of its winds is unbelievable. The neighbors in the 55-and-older community are pulling together to get homes rebuilt now and in the coming days. City of Palm Coast telephones came back up Tuesday morning. All city departments, including the Customer Service and Building Divisions, are now available at their regular phone numbers. Customer Service can be reached at 386-986-2360. Representatives can assist with any calls about water and sewer (wastewater) service, pep tank alarms, and questions about debris pickup. The Building Division can be reached at 386-986-3780 for permitting questions or to discuss whether the contractor you’re hiring has the right license. While it appears that Hurricane Matthew will not rear its head again as officials once feared, it does appear that Flagler County will experience breezy conditions beginning Monday. Conditions are predicted to be worse along the coast than inland. Because damage assessments and cleanup operations will take time, as well as the continued need of shelter space for residents, all Flagler County schools will remain closed Monday and Tuesday, Superintendent Jacob Oliva said Saturday. School officials said Tuesday night that a fake social media account was putting out false information. Classes are still scheduled to resume Wednesday, Oct. 12, Flagler County Schools spokesman Jason Wheeler said. Flagler County schools need to make up five days following hurricanes Hermine ad Matthew. The first of the hurricane make up days will be Friday. It was originally scheduled to be a teacher work day. Additional make up days will be announced at a later date. 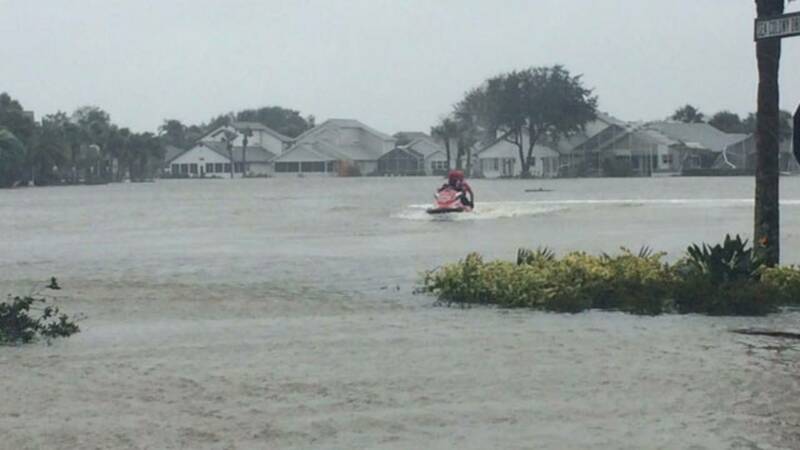 Flagler County officials are urging residents to follow safety tips around floodwater. Clean and dry everything that got wet, as floodwaters pick up sewage and chemicals from roads and commercial buildings. Throw out spoiled and cosmetics and medications that have gotten wet. They are a health hazard. Contact the Health Department at 386-437-7358 to dispose of medications. Do not let children play in or around high water, storm drains or ditches. Besides drowning risks, the water could be contaminated. Additionally, debris and other hazards may not be visible beneath the surface. Look before you step. Floors and stairs may be covered with slippery mud or other hazardous materials. Remember that there are animal hazards such as snakes, rodents (and other small animals), fire ants and scorpions. Any or all of these creatures could have entered homes and buildings looking for shelter.